Zuka Safari Lodge in Phinda Private Game Reserve in South Africa provides an exclusive atmosphere, surrounded by densely wooded hills and lush valleys in KwaZulu-Natal. &Beyond Phinda Zuka Safari Lodge in South Africa is situated in the unfenced western region of Phinda, increasing the Reserve in size. 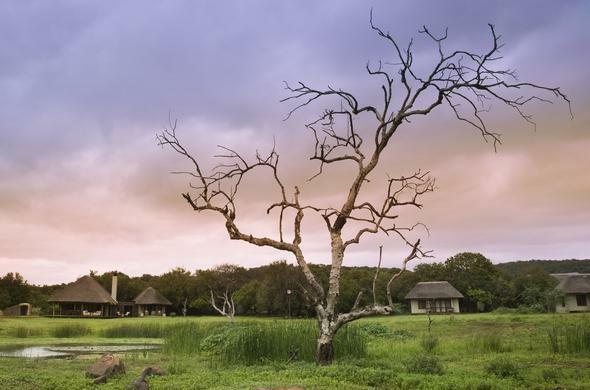 Meaning sixpence in Zulu, Zuka Lodge offers guests a new experience of Phinda's pristine wilderness. This KwaZulu-Natal safari lodge in South Africa has 4 intimate cottages set 15 metres apart, featuring verandas overlooking a busy waterhole where a diversity of wildlife is regularly seen. Sitting areas at this safari lodge in South Africa feature built-in sofas which double as beds for parents travelling with children 5 years and younger. Bedrooms have air-conditioning, fans and en-suite facilities, with a circular stone bath chamber, double showers and twin hand basins. This KwaZulu-Natal safari lodge in South Africa is for exclusive use, meaning you can book it for the sole purpose of your family gatherings or groups travelling together. Seven distinctly different habitats can be seen at this safari lodge in South Africa. Some of the Big Five can be seen with sightings of cheetah, white and black rhino, elephant, nyala and lion.Diverse bird viewing with approximately 400 different species is a must, while on holiday. Phinda's safari lodge in South Africa is situated in a low-risk malaria area, however necessary precautions should be taken. Children are welcome. Regretfully, children 5 years and younger cannot participate in game drives. Child minders are available at an additional cost. Children aged 6 to 11 years may go on game drives at the Lodge Manager's discretion. Private family safaris available.